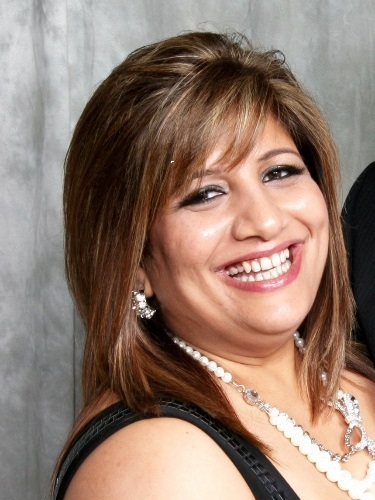 Mum-of-three Sunita was diagnosed with a type 2 meningioma brain tumour after an eye test at Specsavers. She underwent surgery and treatment but lost her battle less than two years later. Her husband Upin has been left with a void in his life and is comforted by the pride he feels in their talented and beautiful children. The day I met Sunita there was an instant connection. It was just like the movies, love at first sight. There was this beautifully stunning girl dancing away and I approached her shyly and asked if I could buy her a drink. She asked for a bottle of water and we sat and talked for what seemed like hours. She wrote down her number on the back of a card and we never looked back. That was the moment that changed my life. I was totally smitten and knew she was the one I wanted to spend the rest of my life with. For our first date, Nita told me to pick her up at Sainsbury’s in Brentford. I didn’t know the area but was willing to do anything for this amazing girl. As hard as I tried, I just couldn’t find Sainsbury’s and drove out of Brentford. Finally, I asked for help and was told it was actually a branch of Somerfield – what a test for a first date! I drove back to Somerfield thinking there was no way she would still be waiting for me. Sure enough, there was no sign of her although she did finally arrive, fashionably late as she so often was. She looked stunning and was just gorgeous. We went to a nearby pub only to discover it was a Chelsea pensioners’ evening so we set off to a club in Knightsbridge which Nita had heard of. Unfortunately, she had never been there and didn’t really know where it was. When we did get there it was full of gangs and we walked straight out and went to a terrible food place instead. On the face of it, it might seem like a disastrous first date but we had the best time, laughing, joking and finding out about each other. I had met my soul mate. From there on, I wanted to spend every second of the day with her, and if for any reason we weren’t together – such as when work got in the way – Nita wanted to know why. I was totally in love and called her every night. She was such a lively and loving person with a zest for life. Every moment with her was exciting and when we were apart I couldn’t wait to see her again. I was once asked by Nita why I had the kids’ photos in my wallet but not one of her, so I showed her that, to this day, I still carry that card with her original phone number on. I will cherish it and the memories of that night and our life together forever. My dad passed away in 1995 and I was totally devastated. He was the first love of my life but Nita showed me I can always remember and honour my dad by being like him. Her love got me through a tough time. Nita had a huge personality. She lit up rooms and was the life of the party where ever she went. My most cherished memories will be the amazing Christmas dinners she made for the whole family, sometimes up to 40 people. She would just smile and laugh through the day, still have time to organise me and tell me off if I had not opened the bottle of red wine for her! Nita was an incredible negotiator and would manage to get great deals on holidays; I would look in awe as when we arrived at a hotel she would work her magic on the reception staff and within minutes we would have upgraded rooms. Sunita began to feel unwell in January 2013. She was suffering from headaches, vomiting and generally feeling weak. I took her to A&E on four separate occasions and each time we were told that she had diabetes and was reacting to the medicine. A doctor even joked with us that at least it wasn’t a brain tumour. Her symptoms continued and, after several visits, our GP finally advised her to get her eyes tested at an optician. She made an appointment at Specsavers in Hounslow and, after three hours of checks, Sunita was told they had found something behind her eye and she should go to Moorfields Eye Hospital as soon as possible. I can remember that day clearly. I had just walked in from work as she returned from Specsavers. She told me what had happened and showed me the referral letter. We jumped into the car with our eldest daughter and drove to the hospital. The doctors carried out a series of tests. We were told they could not carry out a scan after 5pm as it was a Friday and we were referred to the West Middlesex University Hospital. There, Nita had the scan and the decision was made to keep her in overnight. In the morning we were told that a grey mass had been found behind her right eye. As I work for Barclays Bank and benefit from a private medical scheme, Sunita was referred to see a specialist consultant within weeks. We were told that the mass was a type 2 meningioma brain tumour and needed to be surgically removed. The operation, which took place in March, was a success. Following this, Sunita had six weeks of intensive radiotherapy. It was really tough on her and on the family. There were early starts when I would take her for the daily sessions before going to work. She became increasingly tired from the treatment and started to lose her lovely hair. Despite this, her incredible inner strength meant she just smiled through her treatment. In September she organised a Macmillan coffee morning. We had hoped Sunita was on the road to a full recovery but, in February 2014, we were given the devastating news that the tumour was back. She had a second operation immediately and we were assured that this surgery would be much more straight forward as her skull had a flap left from the first operation which would make it easy to access the affected area. We were told the operation would last up to an hour. I waited in anticipation for five-and-a-half hours. Sunita had suffered a lot of bleeding and had suffered multiple strokes. This time Sunita’s recovery was really slow; she suffered memory loss and was very confused as well as losing mobility. Over the coming months the confusion reduced and, steadily, her memory started coming back. Regaining her mobility was a lot tougher but Sunita’s resilience kicked in and soon she was walking with the aid of a frame and, by end of August, unaided. Towards the end of the month, Sunita was moved to St George’s Rehabilitation Centre but, within weeks, she fell into a coma. Water had become trapped in the frontal lobe of her brain and an emergency operation was carried out to release the pressure. She remained in a coma for six weeks. Eventually, she started to respond slowly and, just when we thought she was on the slow road to recovery, she suffered another setback, developing pneumonia. Her condition deteriorated so much that she had to remain in intensive care. In January 2015, new MRI scan results revealed the tumour was growing aggressively and had now smashed her eye socket. Sunita was unable to breathe unaided and we were faced with very difficult decisions. As a family we agreed that her life support should be turned off and she left us peacefully on Sunday 10th January. Nita was an amazing daughter, wife, mother, businesswoman and friend and we will cherish the memories which we all have of her. Her beloved dog Zico, who she spoilt with treats and allowed on the sofa, still goes into her bedroom to look for her. I have lost my partner in life and growing old without her is scary; such a big void has been left in my heart and in my life. However Nita has left me three amazing, talented and beautiful kids which I am so proud of. I know she is looking down and thinking the same. I can see her in all of them, so I will never have to look at a picture if I feel sad. I see them and I will smile. Nita is and always will be the apple of my eye and the Bacardi to my coke. We were two peas in a pod. I know that she will be with me and our kids, in our hearts forever. I will miss her every single day. I will love her forever.